I was looking at the latest temperature data for the lower troposphere, from UAH. That is, the latest version (v6.0 beta). Roy Spencer has provided an update at WUWT (archived here). Did you know that the monthly global average for the lower troposphere has been lower than the average for the period from 1981 to 2010 on only 28 of the 128 months since January 2001? That is, in only 16% of the months this century, has the global monthly mean been less than the 30 year average to 2010. That's right. I'm not talking about an average from the twentieth century or the middle of last century. This is the average from 1981 to 2010. Recent times. And that's assuming he's got his tropospheric temperatures right this time around. And it's only happened once in the three years since April 2012. And then only by 0.01°C - in May 2013. Decadal from 1980 - though we're not quite half way through the current decade. Whether or not the lower troposphere has warmed at the 95% significance level in recent years, it's still warming up perceptibly. The above are temperatures estimated for the average of the lower troposphere - up to about 8 km into the air. For comparison, here is what's been happening at the surface where most of us live, decade by decade. dp is asking what "normal" means, and tosses in a strawman. Normal means precious little these days. When temperatures are rising more and more each decade, then it could be centuries before the earth settles into a new "normal". Define “normal”. Describe why it is considered normal. Defend why it can be the one “normal”. Discuss other possible normals. Explain why the one normal is more acceptable than any others. Explain why the accepted normal is applicable to evaluating time frames other than that used to produce the “normal” reference point. Explain how a “normal” can include a well-identified cooling period but not a well-identified warming period. Anybody? This 'normal' thing is a very popular strawman. Sometimes they use 'correct' instead of 'normal'. What is the 'correct' temperature of the Earth? Of course, no one ever said there is such a thing. There's no 'correct' temperature, but there is the climate for which our civilization was built. Seems rather stupid to muck with it. The 1980's were certainly cooler, which explains the lack of cold months when comparing with an average which includes them. The slope of this dataset since the beginning of the millenium (>14 years since January 2001) is slightly negative. "The 1980's were certainly cooler, which explains the lack of cold months when comparing with an average which includes them." 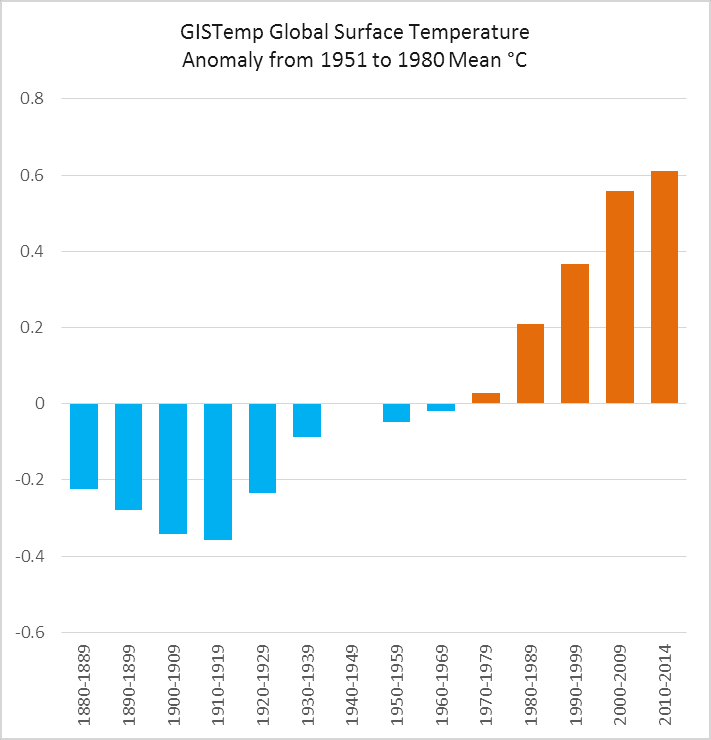 Hey Einstein, that cooling trend goes back decades further than the 80s because, you know, it's been warming for the last century or so. That's pretty much the definition of "global warming", and that explains the "lack of cold months" in recent times. It's not just due to the fact that the 80s were by themselves cooler. "The slope of this dataset since the beginning of the millenium (>14 years since January 2001) is slightly negative." It's no wonder that you posted anonymously - your abject statistical illiteracy is far too profound to sully even a pseudonym, let alone an actual name.